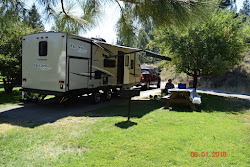 Hello welcome to my blog, I am so happy to meet you all. Here is my Bead Soup contents from Kashmira Thank you Kashmira for this challenge it was a challenge! Thank you Lori for hosting the Bead Soup It has been really fun. 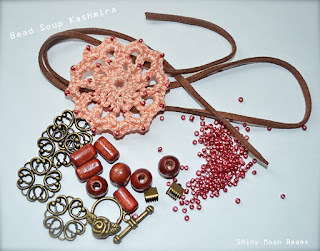 I love the pretty peach medallion but I truly did not know what to do with it, so I put my soup on my desk in a bowl and each day I walked by it and thought about what I could make. Then one day I decided (today) to crochet around a bone ring in a brighter peachy/orange color and sew the medallion onto the crocheted ring. I added the brass filigree from my bead soup and a coral Swarovski Crystal Pearl from my bead stash and sewed them on the top. 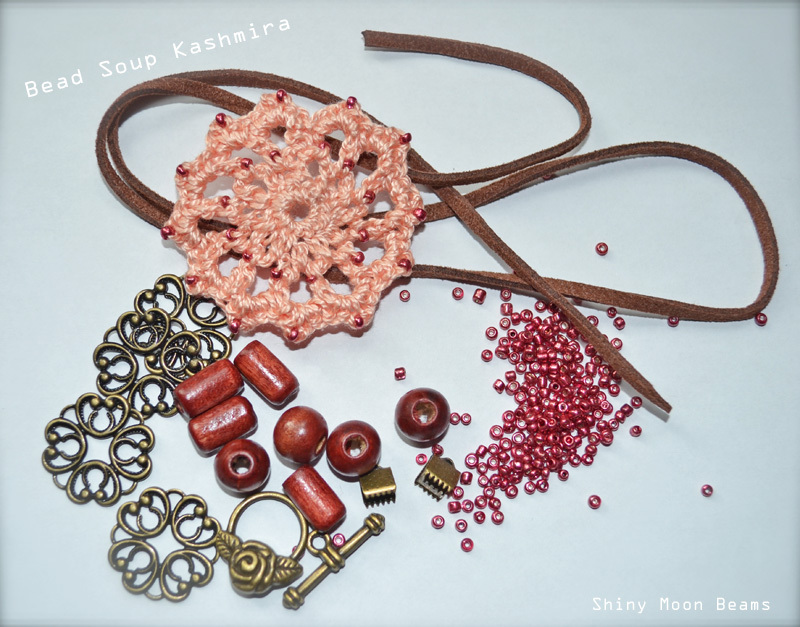 I crocheted the brown chain, and made brass chain out of different brass oval and round rings from my stash along with the brass leafs also from my stash and then added the toggle from the bead soup. 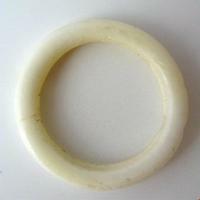 Below is what a bone ring looks like in case you're not familiar with one. I literally had nothing in peach in my wardrobe at all. 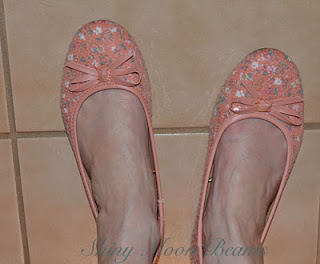 Just happens one day I was shopping and found the peach flats below soon after I received my bead soup and just on accident (forgetting that I had the bead soup) I purchased the flats knowing I had nothing to wear them with. On another shopping day I found the top above at TJMax and realized I now had a really cute outfit but I needed to figure out a design for the necklace. 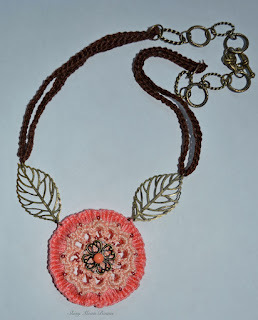 I had a hard time of what to make with the peach medallion, it was just this week I realized what I would do. It's something I will wear the way I have designed it. I wanted to make earrings with the pretty brass filigrees from my bead soup but I didn't have any findings in brass to do so. I set aside the rest of the ingredients for another time. My birthday is the day after Easter on April 9, I always wear something pretty on Easter so this is what I will wear along with a white or black skirt. 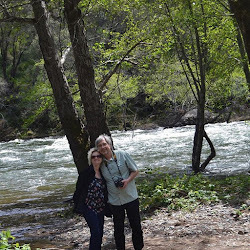 I would be really happy while you're here if you would add your blog to the join this site (In the right side bar), that way I can visit you often by just clicking through to you. Thanks! 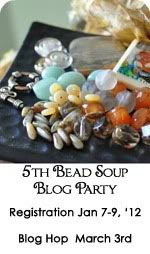 Visit the rest of the Bead Soup Blog Hop! thi is so beautiful and lovely! That beautiful peach focal would have stumped me at first too. The design you ultimately came up with is perfect for it. Absolutely lovely. 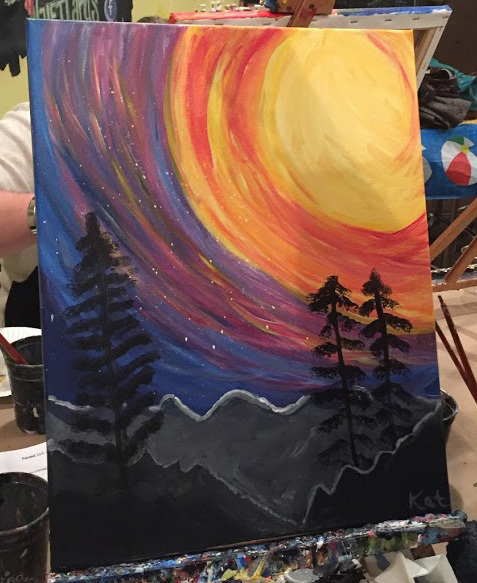 I love what you did with the focal!! That was a really super creative way to handle that focal!!! It is a beautiful piece! I love what you ended up doing with the peach focal! That will look very nice with your outfit. Great job! Kat, how did you attach the filigree and the pearl to the focal? did u stitch it on there? I love peach so I think it is very cool that you found shoes to match your pretty necklace. That is something I would do. What a pretty necklace, you are right-it is perfect for Easter! I really like how you added in different elements. Makes for a visually unique design. A beautiful creation! Yes it has an Easter feel to it for sure. Look at you! 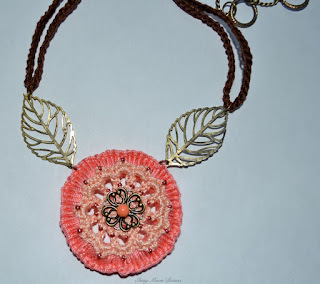 You spiced up that crochet medallion perfectly and got a new wardrobe to boot! Nice. Great way to use components.Well Done!!! 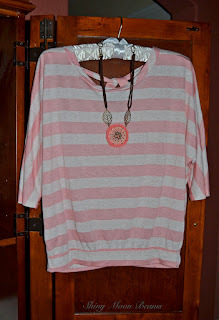 How adorable that you happened upon an awesome outfit to pair with your bead soup necklace! I really like peach, it's just another shade of orange my favorite. When I first saw your soup posted, I was not envious. I would have NO IDEA what to use that crocheted circle for. But you totally ROCKED it. Fabulous necklace. I would totally wear it. Great job using that crocheted piece, I would not have known what to do with it, but you really came up with a great idea, and I think it will go wonderfully with your new outfit. 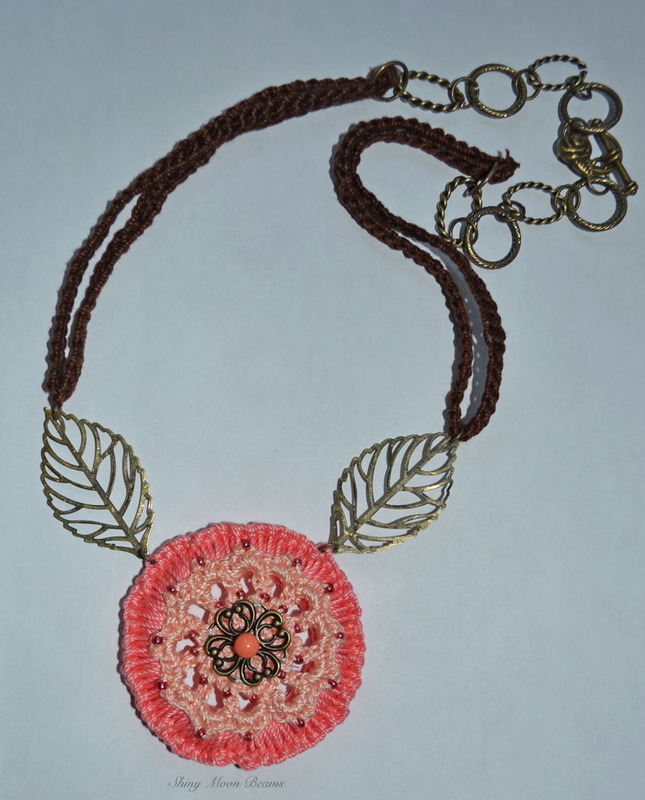 Beautiful medallion necklace! 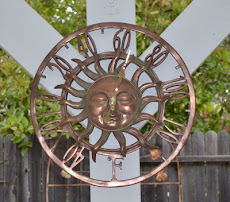 I love incorporating fiber with metal! This is lovely. 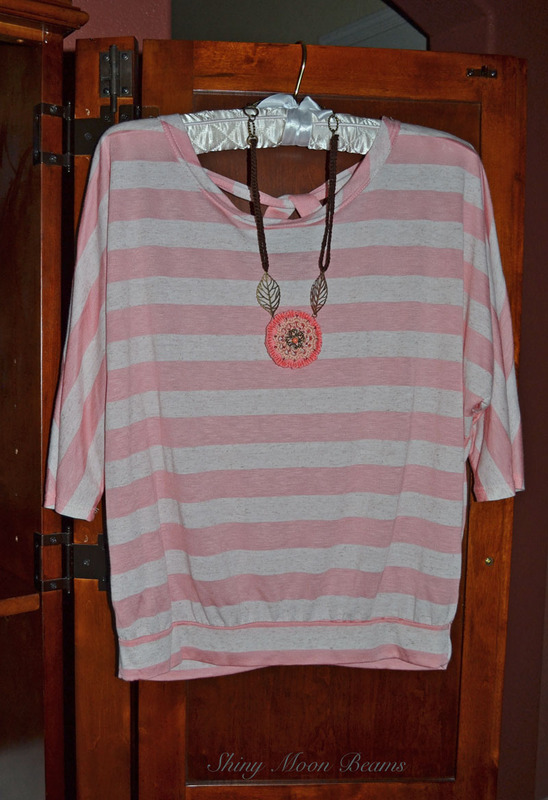 Love it, Its fun how things fall into place necklace shoes shirt!! Excellent job, and what a happy accident to buy shoes that matched! I think you really did well with the pendant. Awesome job. I love the pendant and how you put the finding on top of it. Very clever! Peach is not my favorite color to work with, however, I love what you did with your soup! Beautiful job! What a cute, flowery necklace! The leaves on either side of the focal are such a nice touch. You must have worked very fast to finish all that crocheting so quickly! Fabulous job! I think you did a terrific job with the medallion! The balance is great - lovely necklace! What a brainwave to make a crocheted ring and attach the medallion to it. I think it worked out wonderfully well. Very pretty, feminine necklace! Wow, I love what you designed and I love that you showed us how you will wear it. I'm a sucker for cute flat shoes (I'm 6' tall) the peach shoes are very cute! 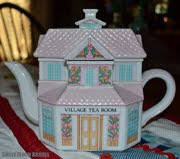 Such a lovely piece! 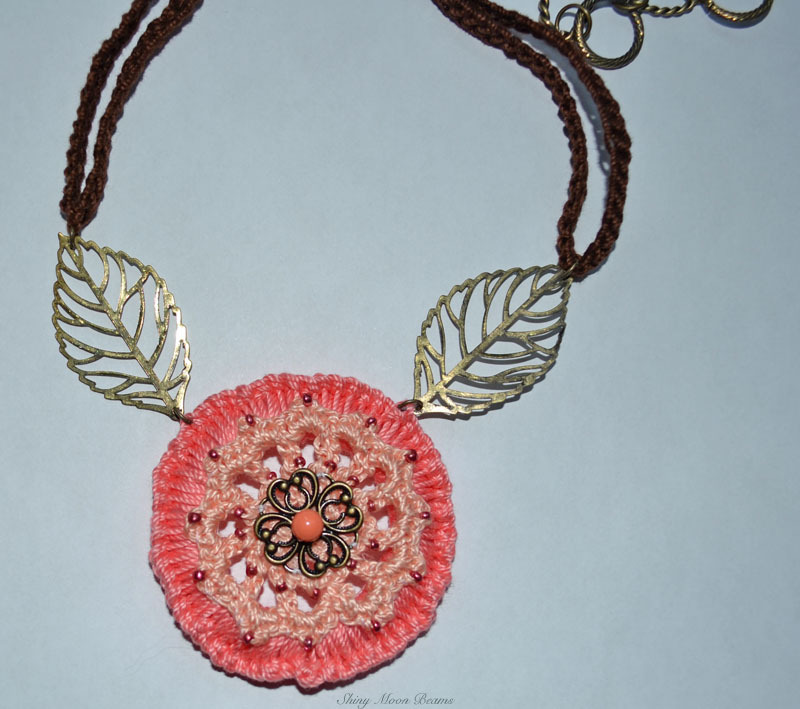 I love the color of the crochet pendant, and the warm color of the metal really shows it off. I think you hit a home run with that crocheted pendant. 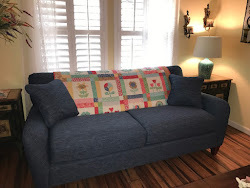 I crochet too but I'm not sure I would ever have thought of what you did. It is a beautiful necklace and looks great with that shirt and those shoes - well, those shoes! You will just be too cute on Easter! I think it is so cool that you bought an outfit to match your beautiful necklace! I love how you really put that necklace together...it shines! Nice job! Perfect match to your shoes and it's sooo cute!! Love it! Oh my Lord, Kat - this is such a wonderful necklace! (btw I did the exact same thing: put the soup in a bowl on the desk and looked at it for a week or two... until one by one each piece came together). I love the idea of the bone ring and the way you layered the focal! Isn't that funny how you found the perfect matching outfit - just in time for your birthday? :) Have a happy one! That turned out just amazing! Wow! Your design is amazing! I wouldn't have thought of it. Also wanted to say, when I saw your quote in your banner, I immediately thought of my dear mom...she would LOVE that quote. I love what you did with the crocheted focal, it was a wonderful idea. Your necklace is very pretty and looks just like spring. What a great idea to use crochet in your soup! A lovely necklace. I would have been absolutely stumped as to what to do with the crocheted flower, but you really powered ahead and made a beautiful necklace. As soon as I saw the necklace, I thought "What a happy bloom!" Excellent work and wonderful design. Great piece....how cool you found shoes to match!